I’ve been working hard on various pieces in the past couple of weeks, including this necklace that I’ve just finished to go into Pieces of Eight Gallery. It is a good example of how I like to work – starting with a general concept and letting it evolve over time in response to how the materials respond, forms that appear in the work, images and ideas from books and magazines I’m reading, objects from the garden, textures I notice, even unexpected accidents that occur as I’m making. I particularly enjoy making these types of necklaces, a collection of fragments – found objects – although in this case all made by me. 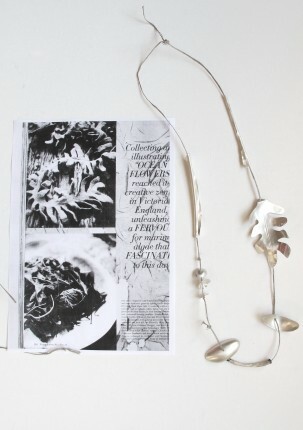 The key fragment in this piece is the “seaweed” – which evolved from some images from Vogue Living which mulled around in my head for a few days and then were realised in the perfect form to complete the necklace. 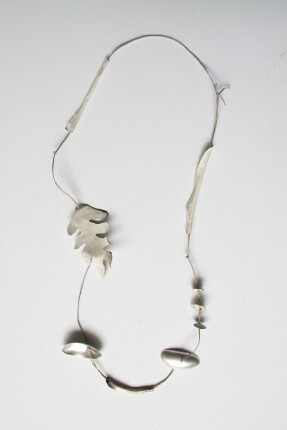 I find the process of stringing of the necklace stressful – doing the mock-up is easy but in making the final pieces I am trying to get it “perfect”. But of course there is no perfect – just a matter of judgement and commitment. Posted on 01.11.11	This entry was posted in pieces i've made. Bookmark the permalink.